Citing Israel’s 3,000 year-long connection to its capital Jerusalem, an Israeli minister maintained that all parts of the city are under Israeli sovereignty and everyone should recognize that- including Austria’s Vice Chancellor Reinhold Mitterlehner. Austria’s Vice Chancellor Reinhold Mitterlehner canceled a planned trip to Israel over his refusal to meet an Israeli minister at a government office situated in eastern Jerusalem. 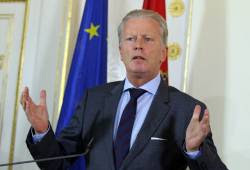 Mitterlehner, who also serves as Austria’s Minister of Science, Research and Economy, was scheduled to arrive in Israel on Sunday Israel for a four day trip to discuss various joint projects with Israel. He was set to meet with Israeli Minister of Science, Technology and Space Ofir Akunis in his office, which is situated in eastern Jerusalem. “We could not overcome the declaration of where the meeting was assigned, because meetings which are outside the ’67 lines we do not attend,” the embassy said. While Jerusalem was united following the 1967 Six-Day War, Austria and other countries do not recognize Israel’s sovereignty over the capital’s east. Akunis refused to move the meeting venue, and in response Mitterlehner canceled his entire trip. “We will not divide Jerusalem, just as the Austrians will not divide Vienna,” he concluded. In November, Akunis canceled his attendance at a joint event with the European Union in protest over the EU’s labeling of Israeli products from areas beyond the pre-1967 borders. Europe has not learned the lessons of history, Akunis stated.